Battery: Aging batteries can be extremely sensitive to cold temps, but even a new battery typically has only 50% of it’s normal power when the thermometer dips to 0 degrees. So, check the fluid in your battery to ensure appropriate levels (check your owner’s manual if you have questions.) Alternately you can take your vehicle to a service station and have the battery professionally checked. A weakened battery may just need to be charged. Oil: If your engine seems a little sluggish in the frigid weather, it’s not your imagination. Motor oil will thicken with the cold, which reduces flow and makes it harder for the engine to turn over. We recommend having the il changed, filters too, to reduce the resistance. While you’re at it you might as well have the radiator checked, and re-fill the windshield washing fluid too. Wiper Blades & Windshield: Many accidents are easily prevented just by increasing visibility. NEVER attempt to operate your vehicle without clearing snow and ice from the windows. Always carry an ice scraper with a sturdy snow brush with you. New England weather can crop up unexpectedly, so be prepared. In addition, snow covered roads usually equate to sand and salted roads. This debris kicks up on your windshield causing the wipers and washing fluid to work overtime. Frequently check wiper blades, washer fluid and replace or replenish as needed. Emergency Kit: Check your emergency car preparedness kit for seasonal items such as gloves, blankets or other winter gear, as well as portable shovel, sand or ice melt, and a scraper. Refill season neutral items, such as road flares, flashlights with batteries, jumper cables, tire gauge and tow ropes. As cold and flu season often coincides with winter months, now is also to perfect time to re-stock your tissues, hand sanitizer and stash of pain reliever/fever reducer medications. Whether or not you love winter, you cannot prevent it from coming. So, best be prepared for all the season may have in store. Please share these brief winter auto tips. Contact us with questions or policy renewal challenges, rick@brownellinsurance.com. 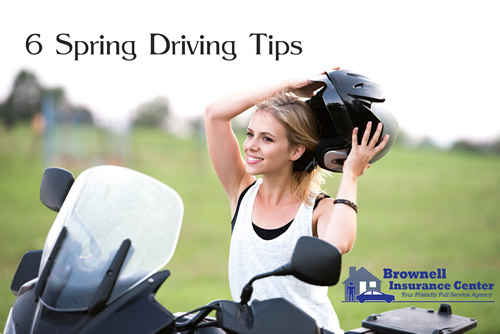 Following a winter hiatus, you may be anxious to get your fun & sporty vehicles back on the road. Perhaps you are ready to put the top down and cruise. Before you hit the road it’s important to check the working condition of your vehicle as it has been garaged all winter. Be sure to thoroughly check the fluid levels (oil, radiator fluid, brake fluid and windshield washer fluid), tire condition, tire pressure, lights (brake and parking, headlights and backup), suspension and brakes. In addition, inspection sticker and registration are up to date if the vehicle has been off the road for longer than a season. With warmer weather comes more animal activity. Some critters are emerging from hibernation or dormant winter activities. It’s also the time where many animals will begin to have offspring close behind. Be aware of animals in the road, either crossing or preparing to enter the roadways. Larger animals, such as deer, moose and bear, are often no match for your vehicle. Share the road. The first warm dry days always entice riders to bring their bikes out for a little pleasure. Understanding that motorcycles and bicycles are not as visible on roadways as cars and trucks, it is important to pay extra attention. When following behind motorcycles, allow for added stop time. When passing bicyclists using bike lanes, allow extra room between them and your vehicle incase either needs to shift lanes briefly. Rain and fog from warming air and cooler grounds can cause reduced visibility. Potholes also begin to emerge as roads thaw and pavement shifts. Always be aware of road conditions and adjust speed and follow distance accordingly. When possible, slow down and/or drive around large puddles. Deep puddles may cause water to get into your brake system and hinder effectiveness. Wet roads and high speeds can also cause loss of traction (hydroplaning) leading to accidents. Anticipate more pedestrians as weather improves. Be especially cautious in residential areas, and school zones as children may be at play and inadvertently dart out in front of your vehicle. Also use extra caution in parking lots and shopping areas. Pedestrians crossing parking lots with bags and packages or entering and exiting parking spots may not be cognizant of you and your vehicle. Spring time often means renewed roadway construction projects. When approaching a construction zone or roadside worksite always reduce speed. Be sure to scan the scene for work crews, as often work can be happening in and on the roadways, themselves. Construction vehicles frequently exit and enter the area via primary roadways. Allow for extra time as traffic may be stopped or delayed. Auto Accident Damage Needing Repairs? Not all parts are equal. Know what kind of parts will be used in your vehicle. Murphy’s Law – It seems whenever you have a new car, you might as well have a target painted on it inviting people to hit your new vehicle? There are some important facts that you need to be aware of before you have your car fixed. In order for you to be satisfied with your car repair, you will need to know what expectations are reasonable. Collision and/or comprehensive coverages promised by your car insurance carrier are meant to return your car to you in like, kind and quality condition as you had before your accident. 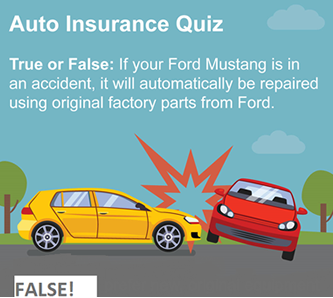 Most people assume that they will get all new factory-direct original parts for their damaged vehicle, but alternative parts are usually used by most insurance companies. 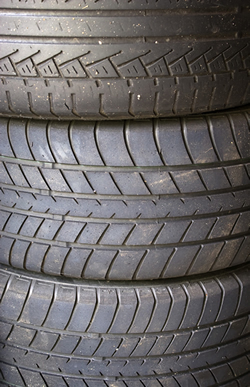 That is okay – for you must consider that your vehicle is not brand-new. Your auto insurance company will usually use the best parts available. Nobody wants to sell or install bad parts, as consumers will merely come back with complaints or lawsuits trying to recoup dollars spent for the damage to be repaired again. Most insurance companies are committed to top-quality repairs and have guarantees that the alternative parts are in good condition. Also included in this guarantee, is a promise that if any alternative part used in repairing your car is defective or damaged, insurance will pay to replace it. This replacement usually includes the cost of the part, labor and rental of another vehicle while your car is being fixed. Aftermarket – a part not manufactured by the original equipment manufacturer (OEM) – the company that built your car. Reconditioned/remanufactured – original equipment manufactured part that meets product specifications using a combination of reused, repair and new parts. With state regulations spotty, car insurance companies have broad discretion in deciding whether to use original equipment or manufactured parts, generic or off-brand, or recycled parts or your car repair. That which restores your car to its “pre-loss condition” so to speak, would be the method used to describe the repair. There is an upside to this reparation using alternative parts; some of these alternative parts incorporate improvements that have been made to the original manufactured part because they were found to have been operating poorly following road tests over the years. You must also consider that the older your automobile gets – the more expensive, under stocked or less available parts become. Requiring auto insurance companies to use only new original equipment parts would cause your auto repair to be either severely delayed or too cost prohibitive to fix thus totaling your vehicle. Mr. Worter of the Insurance Information Institute states, “Elimination of the aftermarket parts industry would drive up repair costs between 50 and 100%. This would cause insurers to declare more total losses from car crashes, with a corresponding increase in auto insurance rates.” He goes on to say, “Ultimately, more cars will wind up in the junkyard and they will be junked at a faster rate than they would be without a competitive crash parts market.” With insurance companies trying to move towards more sustainable and environmentally friendly practices, restricting the use of alternative parts would be counter-intuitive to this goal. It is never pleasant to be involved in an auto accident. The process can be very confusing. It is always wise to make sure you have the best insurance coverage for your situation. At Brownell Insurance Center, we review your auto insurance with you to ensure that you have the best rates and coverage for your automobile. Having the best coverage will ensure that when you get your newly repaired car back from the auto shop after a nasty accident, you will be pleased that your car looks almost brand-new again, with the added benefit that all you had to pay was the deductible required by your auto insurance policy. Dare to compare your auto policy with us –your peace of mind is a wonderful thing to have when accidents happen. Most of us feel we are good, safe drivers. Then the unbelievable happens, an accident (Accident according to the Webster Dictionary is an unexpected, undesirable event.)! Picture yourself driving down your local road – keeping to the speed limit and being diligent to watch what is going on around you. Out of a driveway, someone backs out rapidly and you have no time to stop… You hit the vehicle broadside for you had no possible way to avoid it in time. You and your family are fine but the woman in the other car is badly hurt. Are you responsible for what happened … probably not but what if the other person had no or minimal auto insurance? Your auto insurance would kick in. Medpay Insurance: Your insurance includes a goodwill insurance that will pay a specified amount (usually $5000 to $10,000) to hurt individuals in your car regardless of whose fault the accident is. Please make sure all drivers and passengers seek medical attention. If you have health insurance it will also help pay your medical bills. Collision Coverage: Your auto policy will pay to help fix your car under the collision portion of your policy. Collision can pay to fix your car regardless of who is at fault or when another driver has no insurance. You will have to pay your deductible or co-pay but the rest will be covered by your auto insurance. What if you do not have collision insurance on your auto policy? Unfortunately, you would have to take the other driver to Small Claims Court to seek payment for the damages to your vehicle. Uninsured/Underinsured Liability Coverages: This part of your auto insurance policy pays for the medical bills of the people in your vehicle. If you are carrying $250K/$500K as an example … Everyone in your vehicle will get paid up to $250K with a maximum amount paid out for the accident of $500K. If your medical bills go above $250K per person or $500K for the accident, you will have to pay the balance out of your pocket unless you have health insurance. Another safety net would be to have an umbrella policy. If all of your bills are still not paid, yes, you can sue the driver of the other vehicle but only after the insurance company has received their money back by suing the at-fault driver. Towing and Rental Coverages: These coverages are invaluable if your car is not able to be driven. These riders enable you to have your vehicle towed and secure a rental vehicle while your vehicle is in the shop being fixed. These coverages need to be added to your policy at a slight extra premium, if you wish coverage. As you can see it is important to understand your auto coverages before you purchase or renew your insurance. There are many different varieties of coverages and at varying amounts, which can make purchasing auto insurance intimidating. 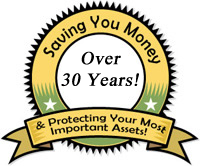 We at Brownell Insurance will carefully walk you through this purchasing process, so you are not caught off guard. After an accident – your fault or not, we do not want you to have any regrets or nagging thoughts of I should have… Could have….. Would have…. By taking the time to thoroughly review your new auto policy at time of purchase or when your policy is up for renewal … You will know what you are covered for and have peace of mind instead of panic. Call our Brownell Insurance offices (603-437-1992 – Londonderry, 603-296-0077 Hampton) or visit our website (www.BrownellInsurance.com) so that we can provide you with valuable information regarding your auto insurance. We are always ready to answer your important questions before an accident or disaster happens!